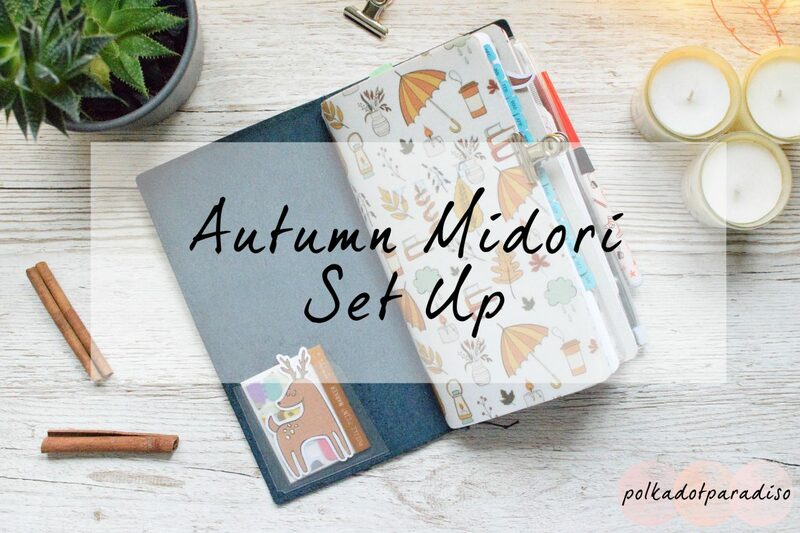 However, after setting up my Midori recently I felt it needed prettying up. After seeing all those travelers notebooks set up beautifully on Instagram I felt compelled to do the same. I’d seen a few TN kits around Etsy but sadly couldn’t find one to match my style. What I could find was a sold out Autumn TN kit from Filofabulouss. Some of the separate parts of the kit were still available, so I picked those up instead. I ordered a set of vellum dashboards, pack of die cuts, magnetic bookmark and a sticker sampler. I couldn’t wait to get my Midori all set up! I’m calling it an Autumn set up, but I know I won’t be changing it anytime soon. I love these colours and have no issue keeping it all year round. First thing you’ll see is the vellum dashboards. It’s nice having something to cover the bland looking notebooks. I have been struggling with keeping these in place though. They just wrap around the notebook but do have a tendency to move around a little. One thing I’ve been struggling with is the lack of pockets in the front. To help with that I picked up some of the Midori sticky pockets to put inside the cover. In the first pocket I’ve popped some super cute Midori sticky notes. They’re so small they’re probably useless but I couldn’t resist them for £2. After my monthly insert, I’ve got my plastic wallet. So far this just holds a few pretty bits of decoration, and some thin washi. I tend not to plan on the go much, but it’s nice to have some washi in the planner just in case. Just like the dashboards, this plastic insert moves around a lot. Every time I open the Midori I have to ‘reset’ this back to the middle. I’ve no idea why it moves so much, I can only assume it’s because the Midori is too stuffed? As I only bought two dashboards, I used the large die cut to cover my weekly insert. I’ve been using the paperclip as a page marker in my weekly insert. While I like the design of the clip, I hate that it covers up so much of my pages. Next up is the other side of my large pocket which I use to store stickers. On the back I’ve stuck one of the Midori pockets, which now holds my planner shop reward cards. At the back I’ve got my Leuchtturm pen loop and another sticky pocket. So far all this sticky pocket has is this adorable bear. You don’t need your planner to look pretty to be functional. The crafty side of me though loves having a creative outlet through my planners. I’m envious of those who can create great planner set ups. I find it easier to do in ringed planners because you need dividers. There’s also pockets ready to fill up with little extras. This was a nice simple first attempt. If I continue to use this planner, I might have another attempt in the new year. This post contains affiliate links. They don’t cost you anything to follow, but help support the blog!